You can use this ornament on your computer or on your letterpress. 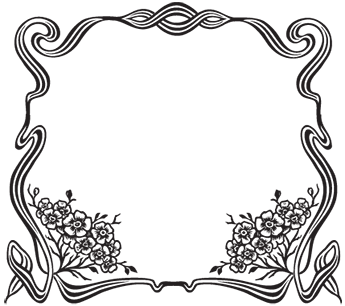 The low resolution image above is suitable for screen viewing, but the Postscript file (vector line art saved as .eps) will produce a far sharper print. In Postscript format, the image can be resized without any loss of clarity. Import or place it into your document, or open it in path editing software. More info. You can use this image on your letterpress by having a cut made. Photoengraving companies can produce a cut, sometimes referred to as a linecut or a die, that is mounted on a type-high block, ready for letterpress. See the Printer's Yellow Pages for a list of companies that make cuts. More info. This image is free for non-commercial use. Please respect the Cuts & Caps license. You are free to use both the Postscript and the bitmap versions of this image, with or without modification, in your non-commercial work. Please do not redistribute the Postscript file. More info. Governed by a Creative Commons license.